As the federal government shutdown continues into its 10th day, surveys continue to show that Americans want compromise—but mainly from the other side or in the abstract. There was movement today on Capitol Hill toward a short-term solution on the standoff over raising the debt ceiling in order to prevent the U.S. from defaulting on its obligations. But when it comes to a measure to fund the government and end the shutdown, majorities in both parties have said it is unacceptable for their side to give ground. In Pew Research Center’s latest survey, three-quarters of Republicans (77%) say President Obama should agree to a budget deal that includes changes to the Affordable Care Act. More than half (54%) say it would be unacceptable for Republicans to drop this requirement even if it were the only way to end the shutdown. 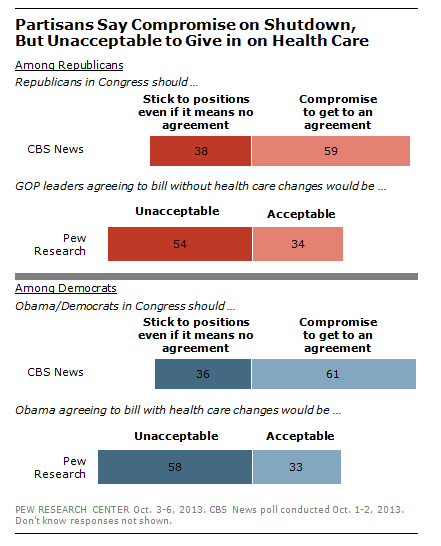 A similar share of Democrats want a deal with no changes to health care (75%) and say it would be unacceptable for Obama to give ground if it were necessary to end the shutdown (58%). However, when compromise is presented as a general concept with no specific tradeoffs mentioned, the public’s attitude is different. A CBS News poll last week asked if Obama and Democrats should compromise in order to get a budget agreement and also asked if Republicans should compromise. The survey found that three-quarters of the public want the Democrats to compromise and three-quarters say the Republicans should compromise. That includes 61% of Democrats saying their own party should compromise and 59% of Republicans saying the GOP should compromise. And, in our recent survey, six-in-ten (61%) said lawmakers who share their views should be more willing to compromise instead of standing by their principles if it means the shutdown continues (29%). Pew Research surveys dating back 25 years, consistently show that the public, as a general proposition, likes political leaders who are willing to make compromises. 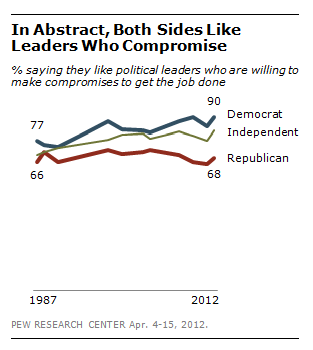 In our April 2012 survey, fully 80% said they wanted leaders who were willing to compromise to get things done and just 16% disagreed. Democrats have always been more supportive of this idea than Republicans (90% of Democrats last year wanted leaders who compromised), but about two-thirds of Republicans consistently express this desire as well (68%). But this general desire for compromise becomes more limited when people are asked about specific issues, especially ones they care about. In 2007, we asked respondents about which party came closer to their views on a variety of issues. We then followed up by asking whether that party should compromise on the issue in order to reach an agreement or stick to its position even if it meant no progress would be made. When it came to specifics, the public was far less interested in their side compromising. For example, when people were asked if they wanted their preferred party to compromise on abortion policy or stick to its position, just one-quarter (25%) chose compromise and 72% preferred not compromising, even at the risk of getting nothing done. And on other political issues, where specific choices were mentioned, only about half said that their side should compromise to reach an agreement. 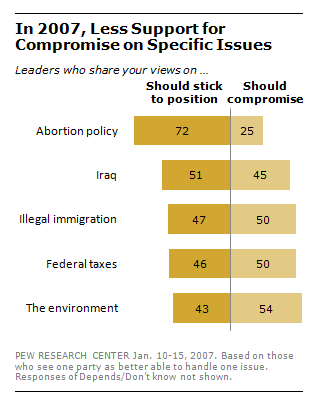 Among those who said that a certain issue was their top priority, even fewer said their side should compromise on it. In the battle over funding the government, the health care law – which Republicans have put at the center of the debate– brings out passionate views on both sides. A Pew Research survey last month found that two-thirds of the public (67%) either strongly supports or strongly opposes the health care law. This intensity likely goes a long way in explaining why Americans want their leaders not to throw in the towel on the shutdown, though they still favor the idea of compromise in general.